HNA, one of China's largest companies, failed to disclose details about its ownership, including the fact that some of its owners are Communist Party of China members and current Chinese government officials, according to Trump administration officials. The company also failed to disclose financial ties to the Chinese government in two voluntary requests for federal government reviews of purchases that might impact U.S. national security. The misleading information about HNA's ownership and structure surfaced during the reviews by the Treasury Department-led Committee on Foreign Investment in the United States, known as CFIUS. The first case involved the proposed purchase by HNA of SkyBridge Capital, a New York-based investment fund owned by Anthony Scaramucci, a close adviser to President Trump who was fired as White House communications director after 10 days on the job in July. The proposed purchase, that remains stalled in CFIUS review, is viewed by some analysts as a bid by China to buy influence within the Trump administration. The second case was a CFIUS review of a proposed purchase by a HNA technology subsidiary of Ness Technologies, a New Jersey-based software engineering company. Ness sued HNA after the HNA's ownership was revealed to include two Communist Party members, Chen Feng and Wang Jian, who were not revealed in an initial notice to the government review panel. Court papers in the civil lawsuit filed by Ness revealed that during the CFIUS review process, HNA changed the description of the owners of HNA by identifying Chen Feng and Wang Jian as owners. Chen is currently a Chinese government official. The lawsuit charges that HNA, in its CIFIUS review notice, submitted "knowingly false, inconsistent, and misleading information" about its ownership. A White House National Security Council spokesman declined to comment on the HNA sanctions. HNA spokesman Alex Hong did not return emails seeking comment. The changes in the CFIUS submission by HNA were prompted by investigative news reports last year that raised questions about HNA's ownership first disclosed by a Chinese dissident. The case of HNA has prompted Congress to draft legislation that would strengthen the CFIUS review process. "If the allegations against HNA are true and the company intentionally mislead CFIUS, then our government must take immediate action," said Rep. Robert Pittenger (R., N.C.), a leading sponsor of the CFIUS legislation. "At a minimum, CFIUS should reconsider and re-open previously approved transactions involving HNA." Additionally, CFIUS should take steps to block HNA from attempting to merge with or acquire any U.S. companies in the future, Pittenger added. The CFIUS legislation is expected to pass and the White House is supporting the reforms. Meanwhile, in an internal speech to HNA's board of directors on Feb. 4, Wang Jian, the company co-chairman, stated that HNA is battling against a conspiracy against the Chinese government by "hostile forces" within China and abroad that also are seeking to destroy the company. Wang said the company is besieged by the American government and journalists as part of an anti-communist program. "This incident of HNA is a political incident," Wang said. "It is the crazy counterattack of the domestic and foreign reactionary forces against China's rise and a major conspiracy against the Communist Party Central Committee with [Chinese Party leader] Xi Jinping as the core." HNA was identified last year by Chinese dissident billionaire Guo Wengui as linked to powerful political leaders and their families led by former Politburo Standing Committee member Wang Qishan, who helped set up HNA and is said to secretly control its wealth through associates or relatives. Wang Qishan stepped down from the seven-member collective dictatorship last fall amid questions about his overseas investments disclosed by Guo, an entrepreneur who has raised Beijing's ire by disclosing high-level government corruption. Guo has claimed Wang has an estimated $35 billion in U.S. investments, although HNA has denied any ties to Wang and is suing Guo, the New York Times reported. News reports from Asia have reported recently said Wang Qishan is still in favor with current supreme leader Xi Jingping and could be named vice president of China. Until recently, HNA was a rapidly-growing conglomerate that made $16.4 billion in purchases in the United States in 2016 in a range of industries, including stakes in Hilton Hotels and Deutsche Bank, along with interests in technology companies and real estate. Bank of America reportedly stopped doing business with HNA over concerns about its murky ownership. The company was formed in 1993 as Hainan Airlines with the help of Party official Wang Qishan. Through the company's connections to Chinese government and Party officials it is now worth an estimated $100 billion. One of the company's earliest investors was George Soros, a major Democratic Party donor, who purchased 25 percent of the airline in 1995 for $25 million, according to a report by a New Zealand think tank. However, HNA is facing financial difficulties due to the buying spree around the world of some $50 billion over the past two years and has begun selling off many of its foreign purchases. The company told creditors in December it could face a liquidity shortfall of some $2.4 billion, Bloomberg News reported. The Beijing government apparently fears if the conglomerate goes bankrupt, the failure could produce a chain reaction of financial failures that would undermine the entire Chinese economy. Another action by the company during the CFIUS reviews that is under close scrutiny by the Trump administration was HNA's decision to donate $18 billion to a New York charity called Hainan Cihang Charity Foundation. The donation was made by a company director in his 30s named Guan Jun. But the New York Times reported that Guan held and donated the shares for other HNA shareholders. The Ness court papers against the HNA subsidiary known as Pactera state that HNA officials told CFIUS officials in June that a group of shareholders had agreed to donate their shares to an HNA charitable foundation upon their deaths. Later, HNA officials said several shareholders agreed to accelerate the donations to be made in 2017 to "resolve public questions regarding HNA's ownership." The Ness deal with Pactera fell through in December and the company is seeking $65 million in damages. 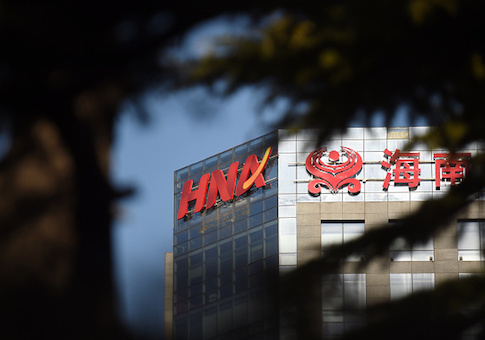 The disclosures by HNA in July indicate the company is controlled by two Chihang charities connected to HNA, one in New York and a second on Hainan, the island in the South China Sea. The two charities are said to own 52 percent of the company while 12 company officials, including Chen and Wang own 47.5 percent. HNA is one of the largest landowners on Hainan, the island that hosts several major Chinese military facilities. Chinese naval forces on the island have been leading the illegal militarization of islets and reefs in the South China Sea. Regarding the company's formal notice to CFIUS, the court filing stated that "CFIUS staff stated the notice presented a rare and troubling situation because parties do not usually ‘change their stories' before CFIUS as Pactera and HNA Group had repeatedly done." Among the several changes made by HNA in its CIFIUS notice, the company disclosed further links to the Chinese government, including credit agreements between the Chinese government and HNA for a loan of over $150 million and a loan for over $25 million. This entry was posted in National Security and tagged China, Sanctions. Bookmark the permalink.